I recently found myself in need of a new wine storage unit. So, off to Arizona Wholesale to see what might be available. My friend Jeff Smith took me to their outlet department. The outlet department has all the Arizona Wholesale model home returns, scratch and dents, and unboxed appliances that cannot be sold at the full price. For the most part these appliances come with full warranty, have not been used, and are in good condition. It’s a good opportunity to save some money if you don’t mind purchasing an appliance that has been out of the box. 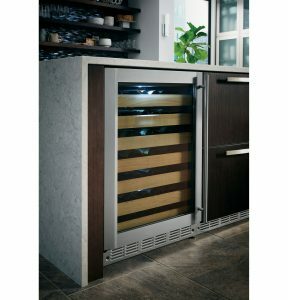 Though I didn’t find what quite what I was looking for, I did get to see a good variety of undercounter wine units, and become familiar with some of the features and benefits of the various brands. After comparing models and prices, I settled on a Monogram Wine Reserve. This appliance had all the features that I wanted, as well as a few benefits that I hadn’t considered. It fit in the undercounter space that I had available, and was a good value especially considering all that it had to offer. Monogram is a luxury appliance brand from GE/Haier that has a long heritage, and a good reputation for reliable products. Their wine reserve fits undercounter in the same space as a dishwasher. Holding up to 57 bottles, with full extension racks that are also removable, the unit can be configured to hold bottles positioned either horizontally or vertically. Equipped with premium features such as temperature controls preset for both red and white wines, as well as custom user preferred temperatures, wine aficianados will appreciate the flexibility. Other features include reversible door swing, flush installation, and fully extendable racks. Importantly, the tempered glass door, is UV resistant to shield wine from harmful rays. If you are in the market for a new appliance, want to save some money and don’t mind getting a model home return, consider visiting the outlet department at the warehouse location of Arizona Wholesale. While you’re there, check out the stunningly beautiful newly remodeled showroom.